As long as there has been rock & roll, the electric guitar has been at the center of it. That is especially true of the current breed of alternative rock, which if there weren't distorting grungy guitar amplifiers, wouldn't exist. But over the years, there have been rockers who play the piano. Going back to the early days, there are Jerry Lee Lewis, Little Richard, plus Elton John, Randy Newman and Bruce Hornsby to name some of the relatively few. This week we have a band whose sound is not only centered around the piano, they have no guitar, and yet a group that in some ways could be called an alternative rock band. A better description might be a kind of alternative to alternative rock, sharing the level of energy and sometimes punky attitude that comes with being alternative. They call themselves Ben Folds Five and their new, major-label debut release is entitled Whatever and Ever Amen. Ben Folds Five takes their name not from someone named Benjamin creasing a quintet of something, but from its pianist, composer and lead vocalist, Ben Folds. Of course as one might suspect, Ben Folds Five has three members, with Darren Jessee on drums and Robert Sledge on bass. Ben Folds has spent several years in the music business, including time in the Nashville commercial music scene before forming the Five in Chapel Hill, North Carolina in 1993. In a recent interview, Folds said he had been playing in bands since an early age, but never in a group with, as he describes it with a guitar player as a piano player. He describes himself as a rock and roll piano player but he is not without jazz influence, such as more complex chord voicings and song arrangements than you'll usually find, especially in alternative rock. And he likes to jump around in style, from banging away with considerable energy to more ballady material, to jazzy waltzes, to something with a bit of klezmer influence. Sometimes within one song the mood will take a hairpin turn. But while there's no guitar in the band, bassist Sledge has a fuzzbox and cranks it up frequently. Folds is a clever, irreverent lyricist, who often sings about dysfunctional relationships, and is not afraid to include spicy language. While the basic trio dominates the album -- and drummer Darren Jessee deserves kudos for his combination of nervous energy and breezy swinginess when he wants to -- the three member Five are supplemented by an occasional string section and some horns on the klezmer-influenced track. The album was recorded in Folds' house in Chapel Hill, on his well-used Steinway grand and an even more beat-up upright piano he keeps in his bedroom. The result is a record that's rather hard to pin down stylistically, and full of little surprises. 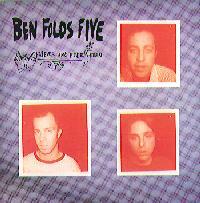 Ben Folds Five are a clever and intelligent band from North Carolina who have a lot of things going for them. Their guitar-less, piano-dominated sound, interesting songwriting and first-rate musicianship that ranges from punk-influenced to jazzy, combine for a sound that has lots of energy. Folds is an appealing singer whose voice fits well with his musical approach, and his bandmates do some passable Beatles-influenced backing vocals. When bassist Robert Sledge cranks up his fuzz bass, the three-member Five could pass for alternative rock, while at other times, Folds can come across as a hyperactive Randy Newman, and at others launch into a kind of musical shtick, and sometimes all in the same song. The result is an impressive album that gives one hope for the younger generation of popsters, though broadcasters like me could do without the four-letter words lurking in several tracks. The group brought in veteran engineer Andy Wallace to mix their self-produced effort, and he did a good job on the sonics. Folds' liner notes talk about Wallace expertly burying the mistakes, but the overall sound helps to maintain the live feel of this acoustic and electric band. This may not be a super audiophile recording, but it helps to impart the group's energy, and even has a little dynamic range that follows their evolving arrangements, though there is still some very heavy compression on the louder tunes. The guitar may be at the center of rock & roll, but Ben Folds Five show that a piano can rock as well, and make ingenious music in the process.